Just Dance 3 was released on October 7, 2011, and it was the first game in the Just Dance series to be a multi-console release. Just Dance 3 was developed by Ubisoft Paris, and of course published by Ubisoft. The game received an ESRB rating of "Everyone 10+" with "Lyrics" listed as content for parents and gamers to be aware of. 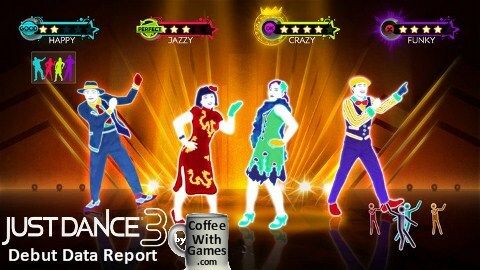 Just how much have Wii owners been dancing with Just Dance 3, and how well does the game appear to be selling? Let's take a look! How many hours have you been dancing? Just Dance 3 has 10,847 Wii owners that have reported game-play data, and the game's average play-time per day/session is 1 Hour 32 Minutes. The average play-time per day/session simply means that each time Wii owners are firing up Just Dance 3, they are dancing for an hour and a half on average. I wonder what the ROI is for the games shown? 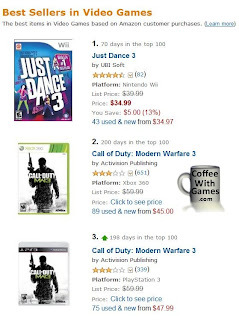 As the image above shows, Just Dance 3 on the Wii has been ranked #1 on Amazon.com for at least the last three days, every time I have checked Amazon.com's "Top 100 Video Games" list. 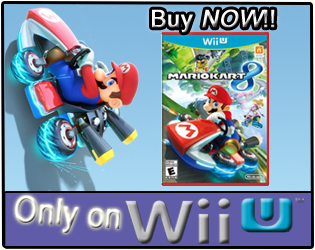 I really think this should put to rest any/all doubts that third parties can find success on the Wii. 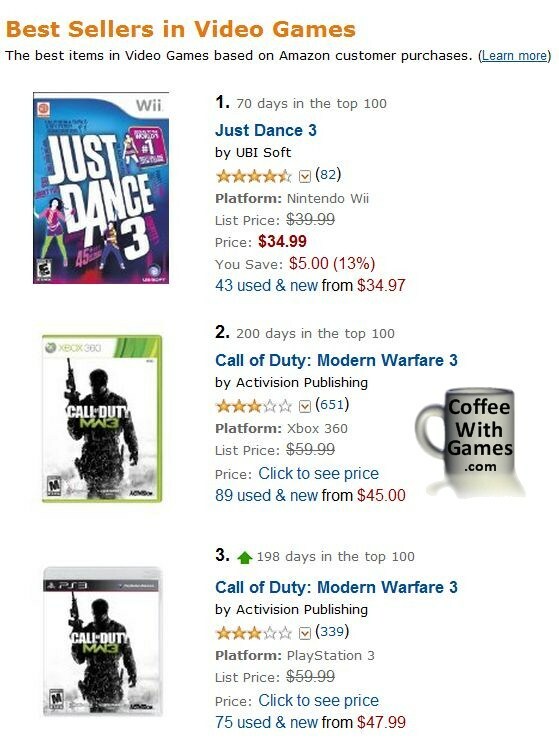 Just Dance 3 has been outselling Call of Duty: Modern Warfare 3, Elder Scrolls V: Skyrim, The Legend of Zelda: Skyward Sword, and many other games on Amazon.com, that I wouldn't have expected it to at this point. 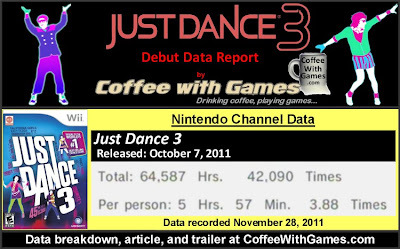 Here's something fun from my caffeinated thoughts, be the first U.S. resident to email me(Scott@CoffeeWithGames.com) Just Dance 3's Wii's "professional" review score average/percentage on GameRankings.com, for example is it 65.00% or maybe 100.00%, and I will mail you one package of Ed Hardy Energy Sticks to help keep you dancing/gaming through the night! When you email me the "professional" review score average, I will update "The Brew" section with the "professional" and customer review scores as I normally show them in other posts. If you missed it, go back and watch the kid dancing around the .15 second mark. I still LOL at him, the poor guy! As for the data, Just Dance 3's data debuted in 52 days, which is slightly longer than Just Dance 2's data did last year; but I think it's impressive considering the game is available on more than just the Wii. While Just Dance 3 isn't on my Christmas list (yet), as I mentioned above, I definitely can see how people enjoy this game and the fact that it is once again selling, apparently, extremely well, I think speaks volumes for how much fun people are having with the game/series. Have any of you been playing Just Dance 3, or have it on your Christmas list? If you have been playing Just Dance 3, do you think it is the best Just Dance game to be released? Is it your first game in the Just Dance series, or have you been a fan of the series since the original Just Dance, and you played them all so far? I'm a big fan of the Just Dance games, and personally I thought JD3 was the most rounded of the series, in terms of tracklist, choreography and overall entertainment value. I still don't know how people play these games for such long sessions. Assuming they're dancing properly, 90 minutes is an obscene amount of time. I'm a serious competitive dancer (ranked as high as 5th in Aus, 460 or thereabouts in the world) away from the Wii, and I'm exhausted after 20 minutes of flat out dancing. I'm happy Just Dance 3 is doing well. It makes message board "gamers" squirm that it's doing so great, and that makes me happy! I haven't actually played this - oddly my youngest, who is a huge music and dancing fan, has never hit me up for games in this series. BTW, we are gonna try and get the MLG Blog back up and running by the beginning of the year! "ranked as high as 5th in Aus, 460 or thereabouts in the world"
Wow! That's crazy, had no idea. While the reported sessions are 90 minutes, that includes menu navigation and perhaps even breaks. And, if the players are playing with multiple people, they could be switching out between songs. I'm just amazed to see how well it is selling, as I don't have cable television, so I have no idea how/if it is being advertised on television. Do you know if your youngest knows about the games? There is the Just Dance Kids games(two on the Wii now), so that one may be of more interest for you. Well, I know the Kinect version if selling well right now, and seems to have pretty favorable user reviews on Amazon.com. As for DKCR, I LOLed last night when I read your comment, because I was already preparing the DKCR report. The game is a blast! I still have MLG on the sidebar, so when you update it, rotate around like the others do as they update. I'ts not a series that I would go out an purchase day one (yet), but I can imagine, especially after the trailer, that the game is a blast with other players. 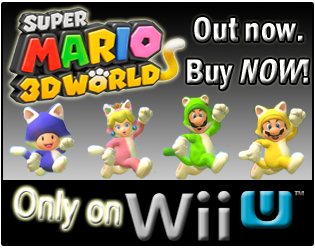 It really does appear that once you LEARN the dance moves, the game would become more fun. Thank you all for the comments/feedback so far, I appreciate them! BTW, did you all skip the first paragraph under the "Caffeinated Thoughts" section?! Just dance is beautiful and great enjoyment games. You allot fantastic description about this. I like so much play this game.